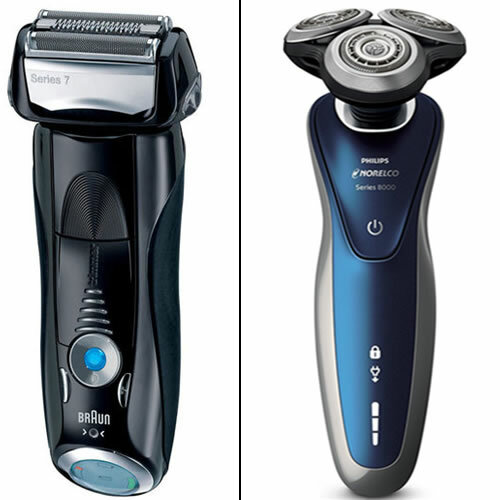 Braun series-9 features an Optifoil-system for perfect closeness while the Philips-9700 has a V-Track Precision system for comfortable-shaving. 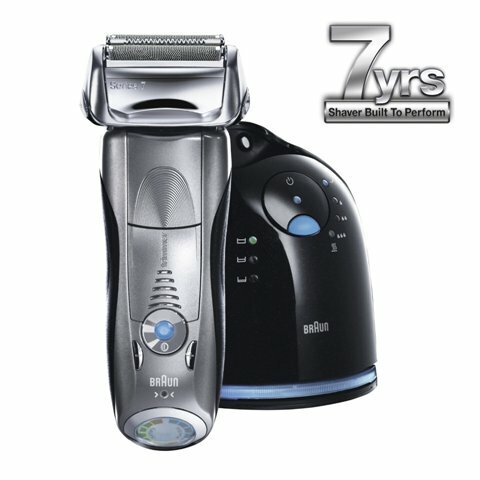 Braun series-9 is good at trimming fine facial-hair while Philips-9700 is good at trimming thick, coarse & longer facial-hair. Braun series-9 comes with a 5-action Clean & Charge Station while Philips-9700 comes with a SmartClean Plus system. Braun series-9 features a 10-D contour adaptation head while Philips-9700 has an 8-Direction ContourDetect head. NOTE: Braun, Philips, Panasonic, Remington & Wahl are the best electric-shavers on the market..!! !Please don’t get cheated by other shaver-brands on the market today. 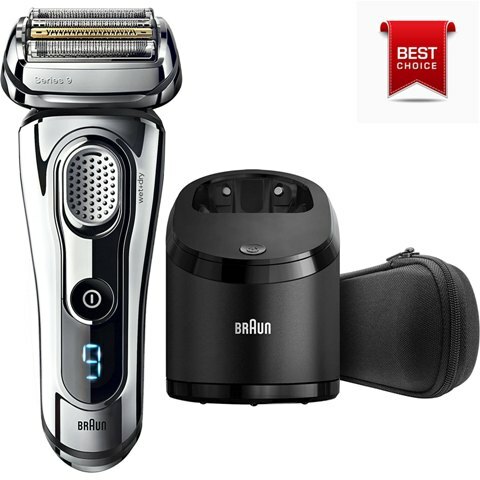 The Braun Series 7 790cc and Philips Norelco Shaver-8900 are the best affordable and high-performance electric-shavers on the market today.Both shavers have a good-rating and are very popular among classic-men. World’s only 5-action Clean & Charge Station. LED battery display for battery-status. Digital user interface with a motion-sensor. Perfect for use on sensitive-skins. 4-action alcohol-based Clean & Charge station. 100% waterproof up to 5-metres. Universal voltage & travel safety-lock. Digital Display for showing shaver-status. 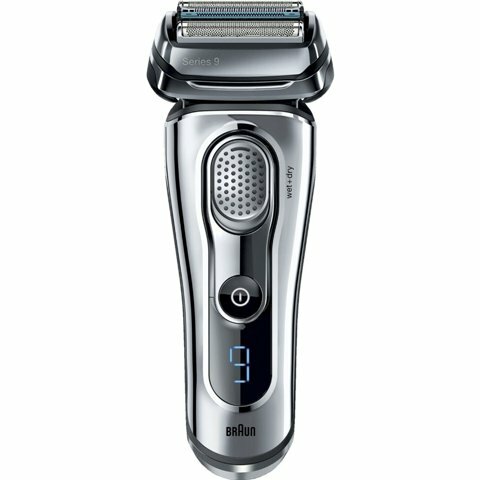 The Braun series-9 is that latest shaver from Braun and has been equipped with the most efficient and effective technologies in order to allow you achieve a more comfortable and clean shaving-experience. This electric-shaver has been proven to trim even 3-day beards since its equipped with Intelligent SyncroSonic technology that uses 4-specialized cutting elements and 40,000 cross-cutting actions per minute to capture different types of facial-hair. it also features the World’s only 5-action Clean & Charge Station that hygienically cleans, charges and lubricates the shaver after shaving while the integrated LED battery-display shows the battery-status, hygiene-indication and a travel-lock indicator. 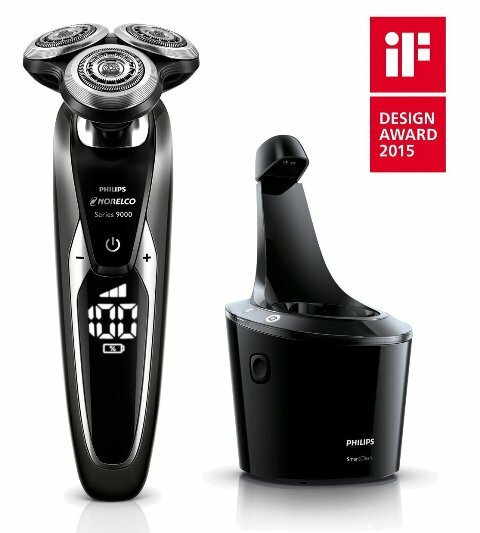 Intelligent Sonic and AutoSense Technology: This electric-shaver produces 10,000 micro-vibrations using its adaptive shaving motor and head in order to help capture more facial-hairs in every stroke taken even on dense-beards. 10-D contour adaptation: Its designed with a 10-direction flexible head with floating shaving-elements that gently adapt to your skin-contours so as to capture all facial-hairs even those in hard-to-reach places. 5 shaving elements: The Braun Series-9 features 4 cutting-elements and 1 SkinGuard that work together seamlessly so that you can get an efficient and comfortable shave no-matter your skin-type. Wet & Dry Shaving: The Series-9 is designed to shave dry for extra-convenience or with water using your best shaving foam/gel in the shower in-order to achieve a refreshing and smooth wet-shave that feels very comfortable on the skin experience. World’s Only 5-action Alcohol-based Cleaning-system: This cleaning-system has been designed to remove up to 99.99% of germs from the shaving-head with just the press of a button. Additionally, it will automatically lubricate, dry and charge your shaver when not in use. On top of that, this shaver is 100%-waterproof up to 5-meters and this implies that it can be rinsed thoroughly under running water. 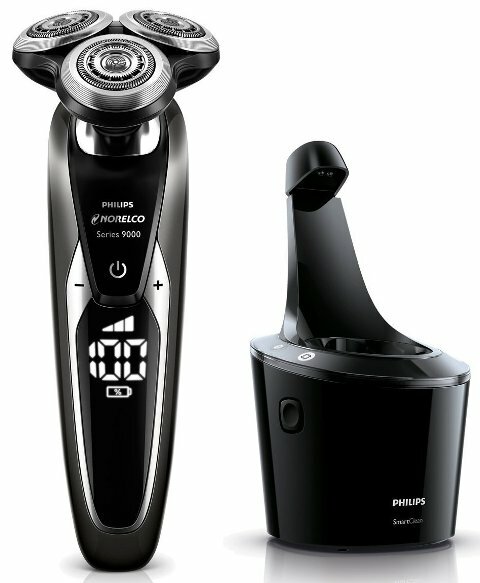 Philips Norelco Shaver 9700 is the most advanced shaver under 9000-series and it features a sleek and attractive design. This shaver features unique Contour Detect Technology that allows each shaving-head to independently move in 8-directions in order to follow every curve on your face so as to achieve a smooth and closer shave in just one-pass. it also features newly designed V-Track Precision Blades that collect all facial-hairs in any cutting position while the integrated personal comfort settings enable the user to customize his shave by choosing a speed-setting that best fits them. 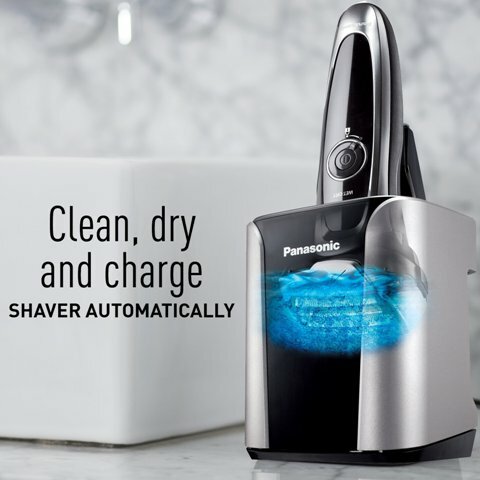 The included SmartClean PLUS System helps to clean, lubricate, dry and charge the shaver at the touch of a button while the integrated Digital-User-Interface with built-in motion sensors helps to control and show the shavers-performance. 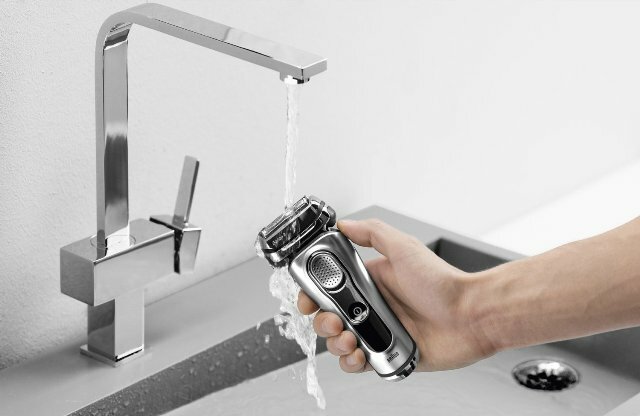 Likewise, AquaTec technology allows you to use this shaver under wet or dry conditions while the inbuilt Lithium-ion battery delivers 60-minutes of shaving after a 1-hour charge and a 5-minute quick charge delivers enough power for 1 full-shave. SHAVING TIME / CHARGE TIME 60-min./1-hr. V-Track blade system PRO: The Upgraded V-Track Precision Blades PRO can gently capture every facial-hair regardless of its length from 1-day up to 3-day stubble. So, these blades can cut 30% closer in fewer strokes leaving your skin smooth and comfortable. Lastly, these blades are self-sharpening in order to ensure a premium shave daily. 8-Direction ContourDetect heads: These heads are designed to follow every contour on your face and neck in 8-directions. This enables the shaver to catch 20% more hairs with every pass taken resulting into an extremely close and smooth shave. Precision trimmer & travel pouch: it features a skin-friendly Precision Trimmer that can be used for detailed trimming of your beards in order to complete your facial-looks. This trimmer is ideal for maintaining your moustache and trimming sideburns. SmartClean PLUS system: At the touch of a button SmartClean PLUS cleans, lubricates, dries and charges your shaver keeping it performing at its best every day. The SmartClean system cleans cut hairs, foam and gel through a unique dual-filtration system. AquaTec Technology: With AquaTec technology, this shaver allows you to enjoy a comfortable dry shave or a refreshing wet-shave in the shower with shaving gel or foam. Digital User Interface: it features a digital user interface with a built-in motion sensor. This premium interface helps to put you in control of your shaver’s performance by displaying the battery-level-percentage, cleaning-indicator, battery-low-indicator, replacement-head indicator and a travel-lock indicator. 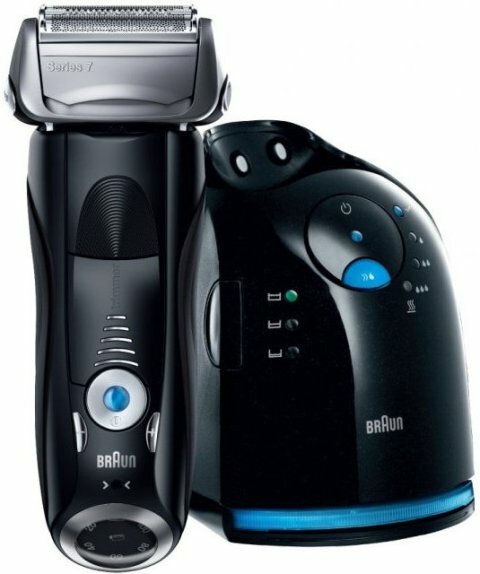 The Braun Series 7 790cc-4 is an efficient and powerful Electric Foil-Shaver that has been equipped with intelligent Sonic technology which automatically increases its power in difficult to shave areas. This shaver features 4 shaving-elements each specialized to trim a different type of facial-hair in just 1-stroke while the integrated 5 shaving-modes will help you achieve a desired shaving-experience no-matter your skin-type just at the push of a button. Likewise, this shaver features 8-D contour adaptation technology that allows for gentle adaptation to your skin while capturing more facial-hairs as you shave. In terms of usability, this shaver can be used under wet or dry conditions because its 100% waterproof and it even comes with a great 4-action alcohol-based Clean & Charge station that automatically cleans, lubricates and charges the shaver. 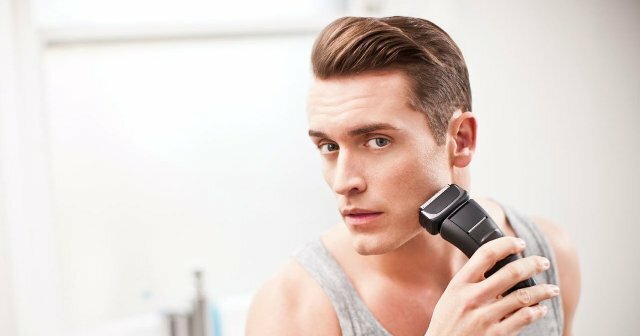 Lastly, it inbuilt Li-Ion battery delivers up to 50-mins of cordless shaving after a 1-hour full-charge. 4 shaving elements: it features 4 shaving-elements each specialized for cutting different type of facial-hair. This enables the shaver to capture even the most stubborn hairs in one-stroke with less skin-irritation. Braun‘s Sonic technology: This technology reads and automatically adapts to your beard. 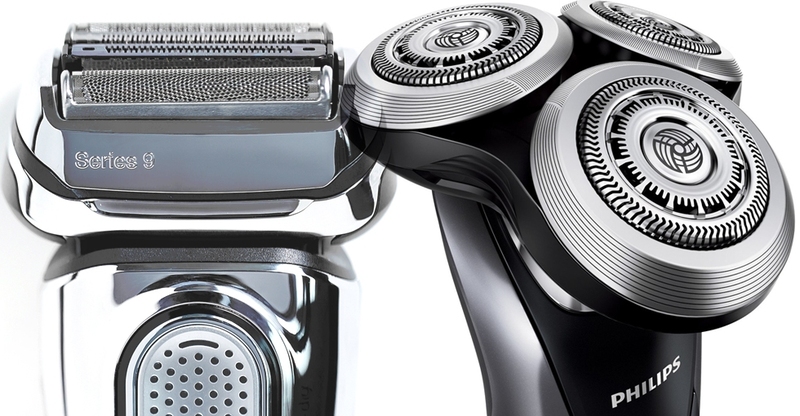 Likewise, this technology provides the shaver with extra-power when trimming denser-spots and that’s really smart. Personalized Shaving: you can choose between the 5 shaving-modes ranging from sensitive to Turbo mode depending on your skin-type and just by the push of a button. 8-D contour adaptation: it features a fully flexible head with floating shaving-elements in order to gently adapt to your skin-curves while capturing more facial-hairs in just 1-stroke. 4-action Clean & Charge station: This system hygienically removes shaved stubble from the shaver and automatically lubricates and charges the charger in order to keep it looking new every day. 100% waterproof: its waterproof up to 5-metres and it can be conveniently rinsed under running tap-water or used to achieve a comfortable wet-shave in the shower. Comfort rings: This Series 7’s advanced technology is great for sensitive skin thus helping you to reduce the risk of skin irritation significantly. The Panasonic ES-LV95-S Arc5 electric-razor for men is an ultimate grooming-tool that was designed to offer a close and comfortable shave. It features five 30° hypoallergenic-blades that provide a gentle shave even on sensitive skin while the ultra-thin Multi-Fit Arc5 foils capture every facial-hair. The 14,000-cpm linear drive motor ensures optimum shaving-power while the pivoting Multi-Flex shaving head glides effortlessly over the chin and jaw line. Additionally, the built-in Arc 5 shaving sensor continuously detects differences in beard density and then automatically adjusts electric-razor power for a more even shave. In terms of usability, the ES-LV95 Arc5 razor is 100% waterproof and be sued to get a comfortable wet-shave or convenient dry-shave in the shower while the included clean and charge station automatically cleans, dries and charges the shaver. 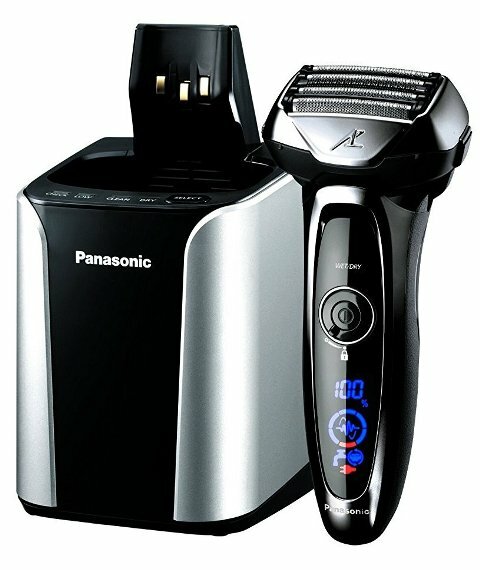 The handy pop-up trimmer on the Panasonic ES-LV95-S adds the perfect finish and detailing of sideburns, mustaches and beards while the 10-stage LED display shows the shavers battery-status, charge-indicator and a cleaning-reminder for blades and foil. Arc5 Shaving System: The premium Arc5 shaving-system ensures ultimate closeness and comfort using 5 ultra-sharp & ultra-thin Nanotech blades. Theses Arc-5 blades are forged and honed to an acute 30° cutting-edge to cut more cleanly and efficiently at the root. 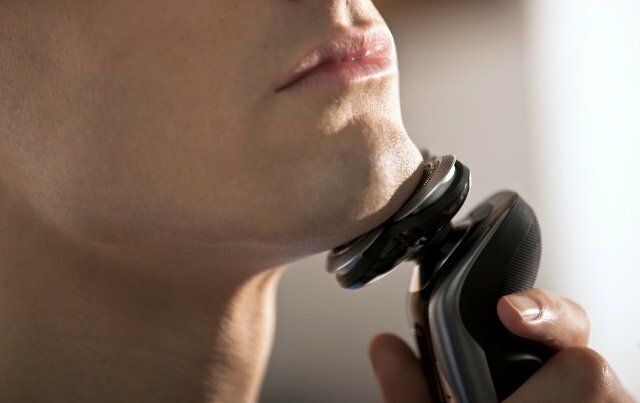 Active Shaving Sensor: The advanced built-in Arc5 sensors automatically detect differences in beard density, along the cheeks, neck and jaw in order to provide a closer and comfortable shave. Multi-Flex pivoting head and multi-fit outer foil: These effortlessly glide, flex and pivot along the every contour on the face, jaw, chin and neck in order to ensure an incredibly close and smooth shave from any direction. Flexible Micro-Foil Patterns: The 3 micro-thin Arc-5 foils instantly capture, hold and cut different types of facial-hair that make-up a beard thus ensuring a closer and more comfortable shave at all times. A Powerful Linear Electric Motor: it features a faster, quiet and high-performance linear motor designed to shave at speeds of 14,000 cycles-per-minute (cpm) and ensures peak performance throughout the electric shaver’s battery-life. Wet/Dry Convenience: you can use this premium shaving machine to achieve a quick, dry shave or comfortable wet-shave over the sink or in the shower with your favorite shaving foam or gel. Premium Automatic Cleaning & Charging Station: This system automatically cleans and charges the shaver after shaving station. However, the Panasonic Arc 5 is 100% washable and can be rinsed clean under running-water using sonic-vibration cleaning mode. 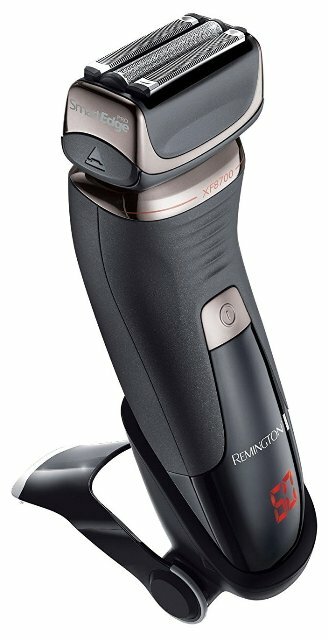 The Remington XF8700 Smart Edge Pro is the latest Shaver from the Remington-brand and this shaver has been equipped with some of the best shaving features that you will ever find today. First of all, it features a revolutionary cutting system that delivers the closest shave in just one-pass while its waterproof WetTech design allows you to shave under wet-conditions or it can be uses as a traditional dry-shaver when in a hurry. 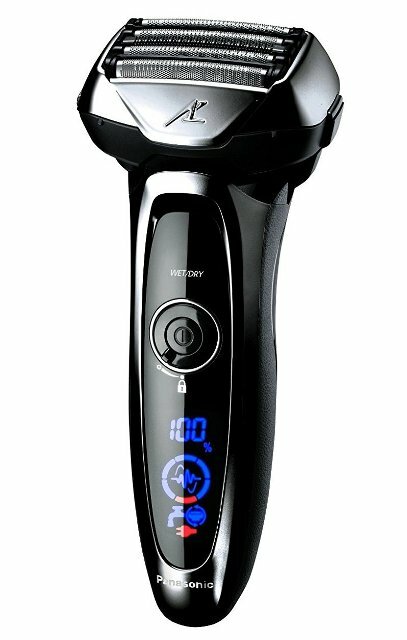 Additionally, integrated lithium-ion battery is designed to provide maximum power and torque to the Motor drive-system in-order to ensure consistent shaving performance while the inbuilt digital display shows the shaver-status all times. ActiveHybrid Technology: The SmartEdge combines the best parts of foil and rotary shaving into one system. This technology pairs outer-foils to pre-trim longer hairs while the inner-foils capture even the shortest stubble resulting into the closest ever shave in just one-pass. ConstantContour Technology: This shaver features flexible foils that are designed to react to every contour on your face ensuring a clean and smooth shave. PivotAssist Plus Technology: The seamless pivoting-action allows the shaver-head to stay close to the face especially in areas around the chin, neck and jawline. AccuCut Blades: These accurate, stainless-steel, open-arched blades help to reduce noise and vibration in-order to provide you with a pleasant shaving experience. Liftlogic Foil: this foil operates in a multi-directional pattern in-order to lift facial-hairs from all angles thus facilitating for a quick and easy shave. Comfort Trim Detail Trimmer: The integrated Pop-up trimmer facilitates for comfortable detailing of facial hairs and sideburns. WetTech: The waterproof WetTech design of this shaver provides you with a comfortable wet-shave over the sink using shaving-gel or you can use this shaver for quick dry-shave out of the shower. Digital Display: the integrated display helps to Accurately show the minutes of shaving run-time remaining and Travel-lock indication in-order to prevent the shaver from turning on when stored. CONCLUSION: All the electric-shavers featured in this post have been tested in order to provide our customers with genuine information. These shavers are very efficient and powerful so as to ensure that you always get a precise, smooth and comfortable shave whether your traveling or when at home in 2019.